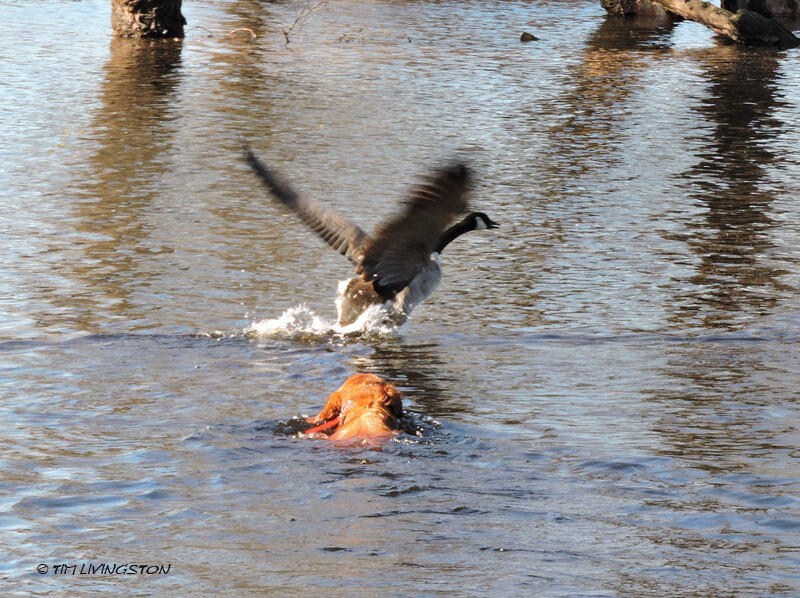 Wild Wednesday … Goose Goose! 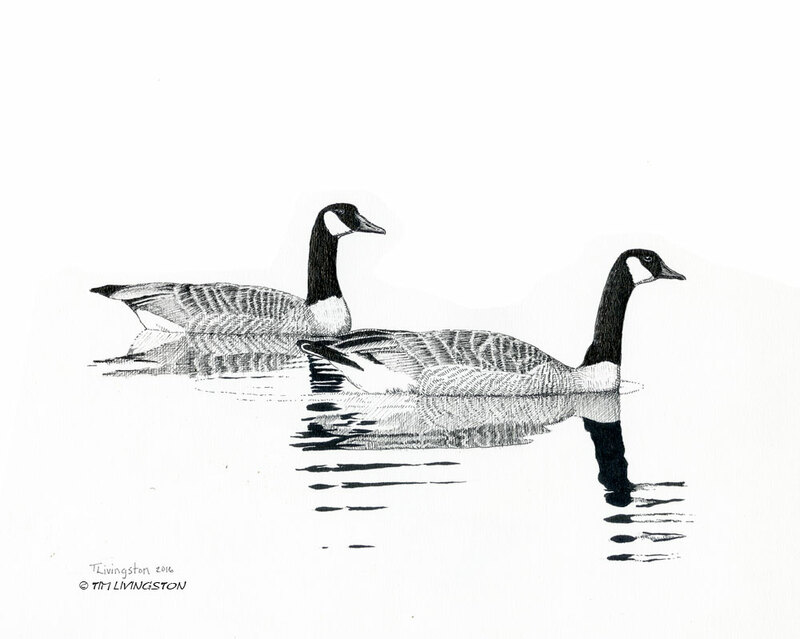 A pair of Canada Geese in pen and ink. This was drawn from a pair of geese on the mill pond. Canada geese are great subjects for pen and ink. They’re already black and white. 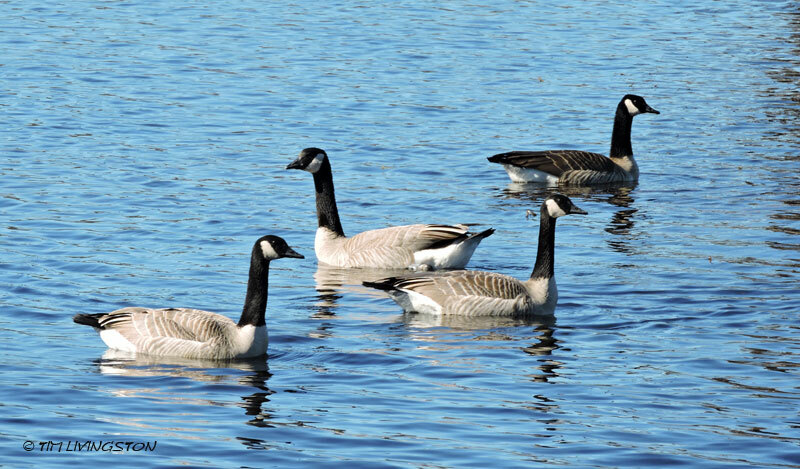 Canada geese can be found on the mill site constantly. This gaggle spotted Sailor and Bliss over on shore. They decided to come over and cause trouble for my goldens, who were minding their own business. Typical rabble rousing degenerate geese! You had to know this would happen. Sailor couldn’t take it anymore and swam out to say hello. What’s a boy to do. Well this isn’t going well. 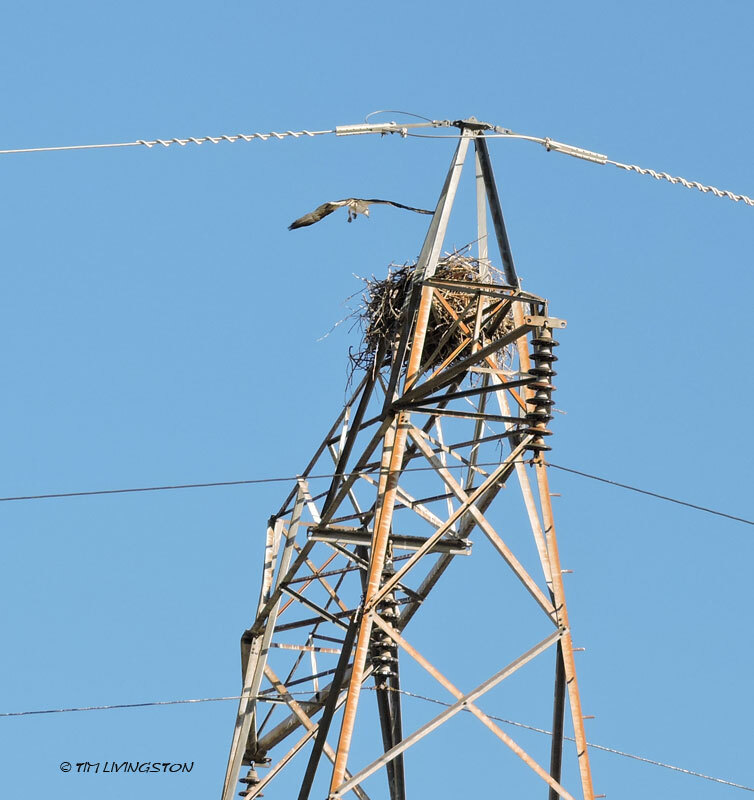 Scanning the Sacramento River, this bald eagle is fishing for breakfast. 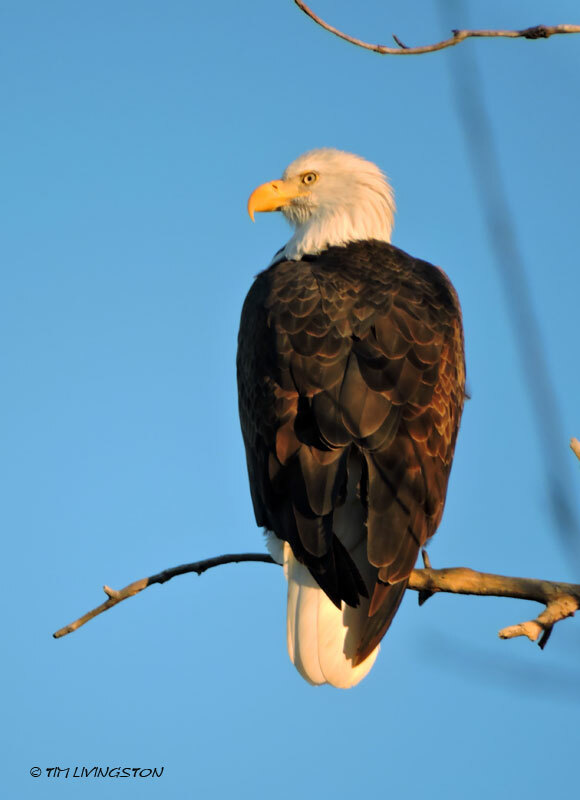 I saw the eagle perched near the boat ramp scanning the river. I couldn’t get a clear picture that wasn’t full of branches. I slid down the bank next to the water. Slid being the operative word, since I almost took a morning dip. I had a clear view for this shot. The eagle never gave me a look. I wasn’t a fish! Perched in the tree tops beside the river waiting for a fish. California Valley Quail on sentry duty. Pen and Ink. It’s tough being a prey item. California valley quail deal with this fact of life by having a sentry to watch over the covey. He’s not much for defending the covey, but will sound a pretty good alarm. 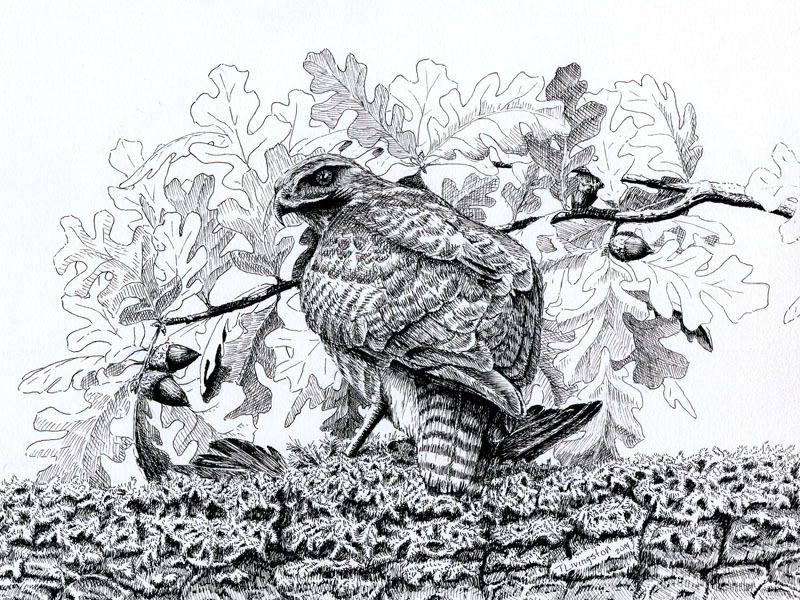 A red-tailed hawk with her prey, in pen and ink. 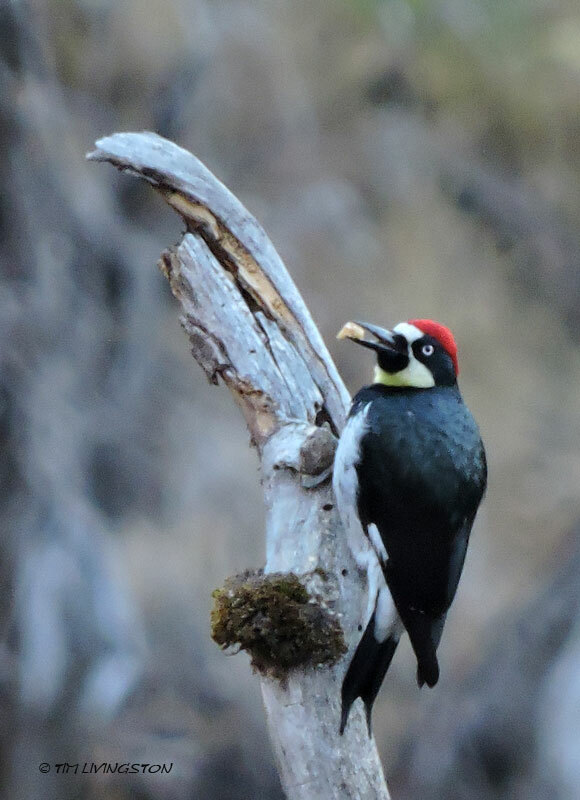 An acorn woodpecker just pulled a fat grub out of a black oak snag. I took this picture in an area that burned in a wildfire in 2008. When it comes to wildfires, woodpeckers are the big winners! 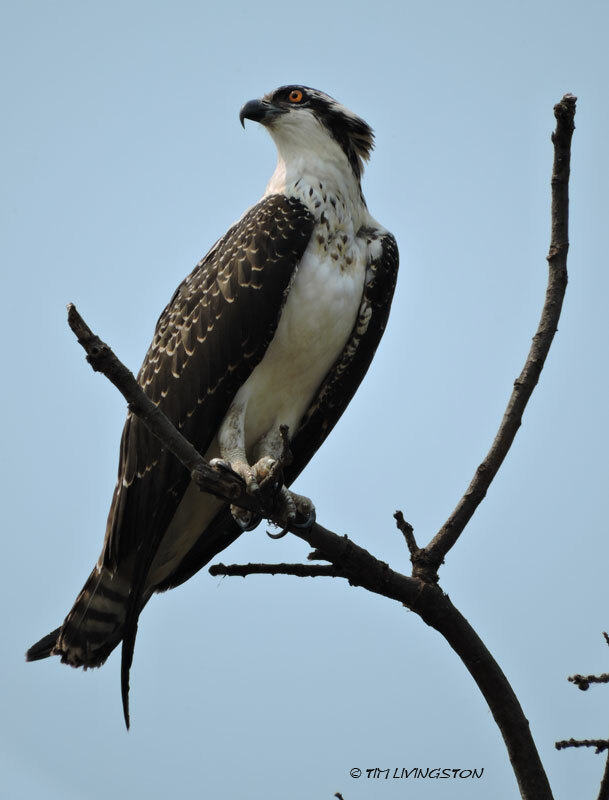 One of the remaining osprey keeps watch from a nearby oak tree. 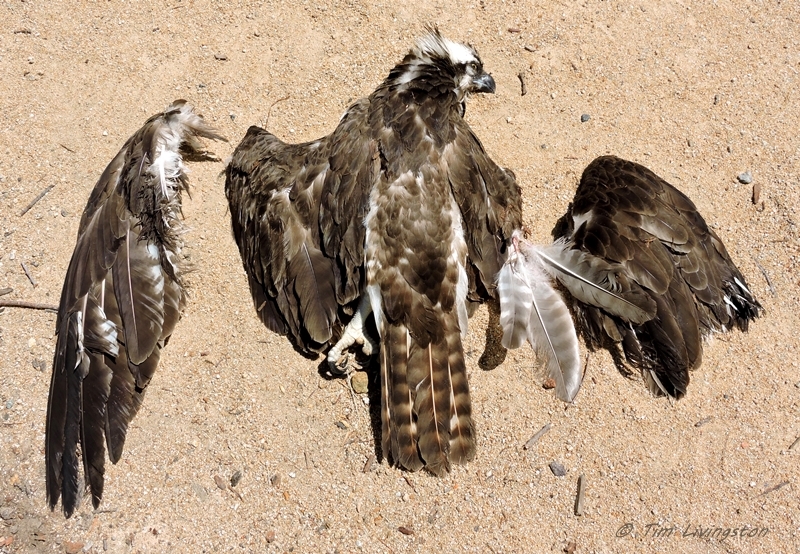 The surviving ospreys have seemed to rally this week after the helicopter incident I blogged about last week, Wild Wednesday … A Death In The Family. 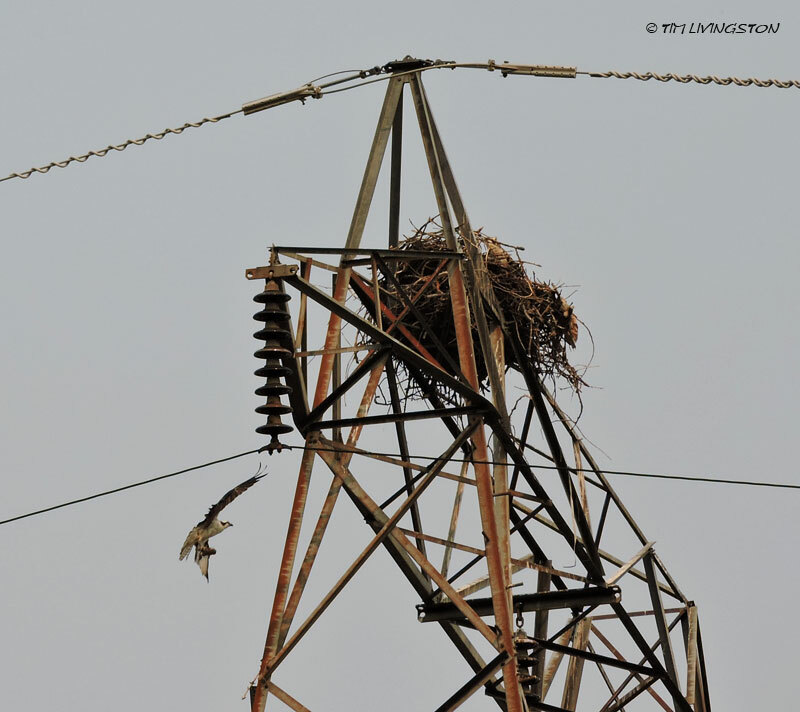 For most of the week only one young osprey was in the nest. It occasionally left, but would return later. It sat in the nest calling for food. 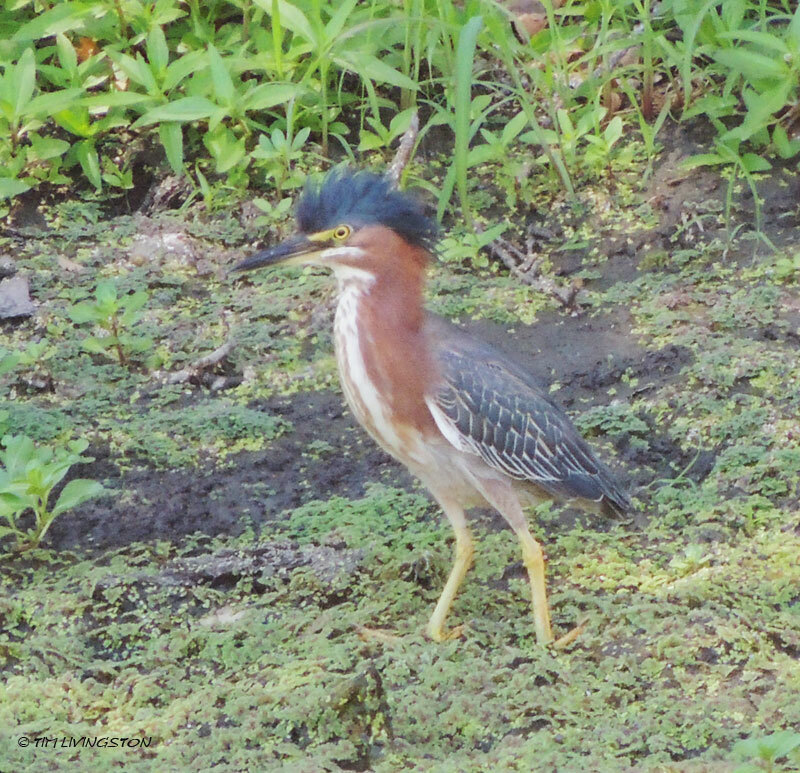 After a few days, I saw the second young bird return. Then both called. The other young osprey awkwardly comes in for a landing. 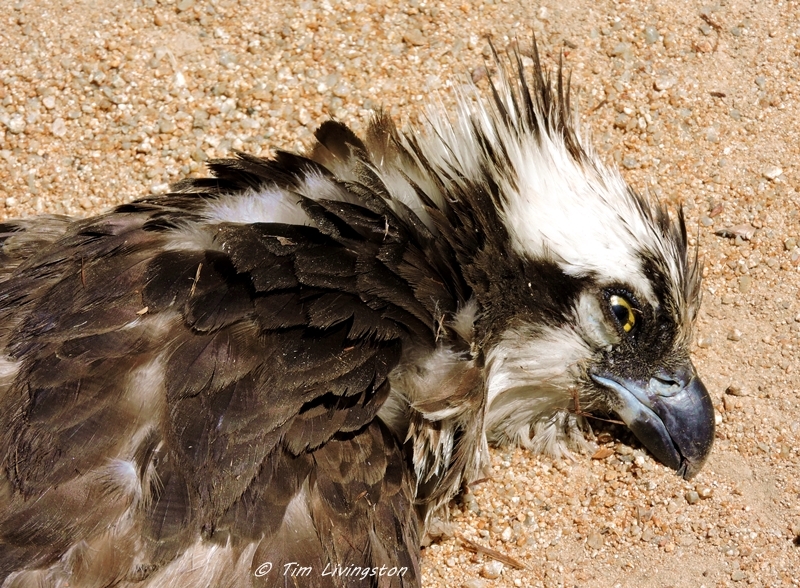 Eventually, I saw the parent osprey. She came in with a fish for the young birds, but didn’t give it to them. 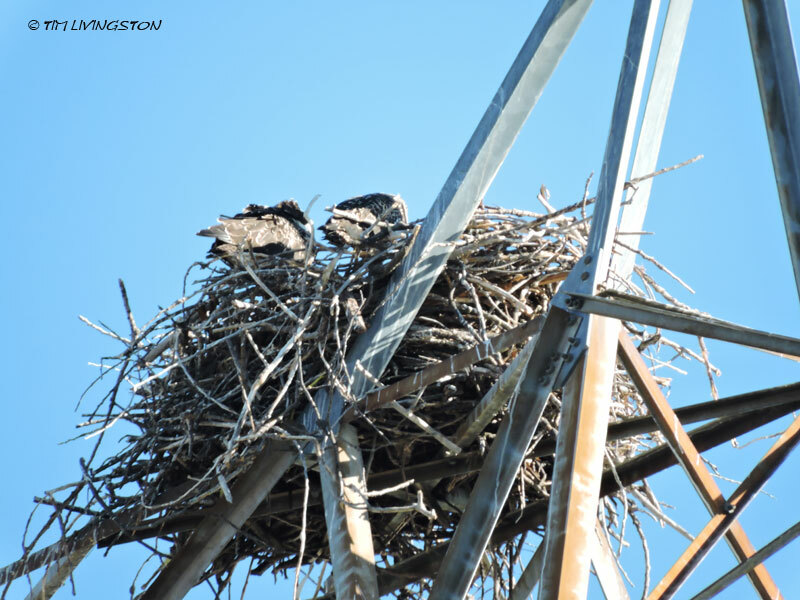 She flew to the edge of the tower and started calling the fledglings. 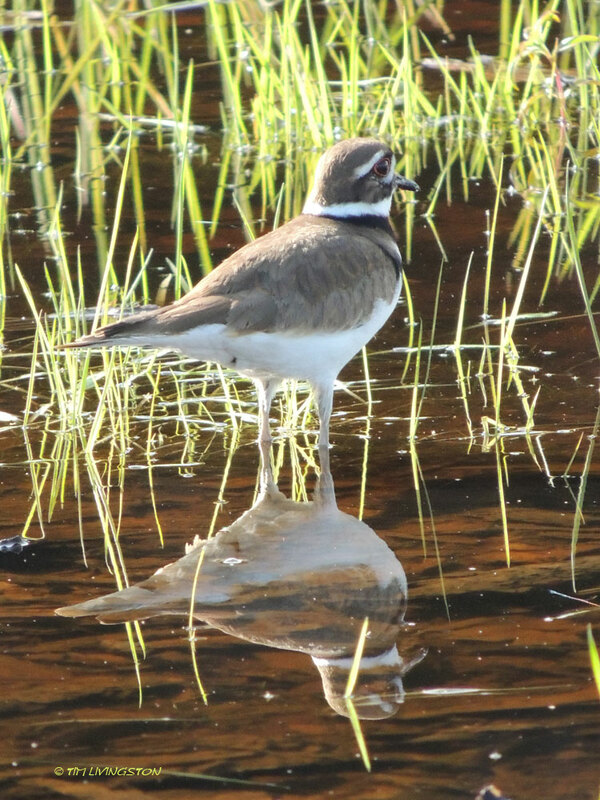 When the youngster moved toward her, she lifted off and flew up river. She was training her young fish hawks. 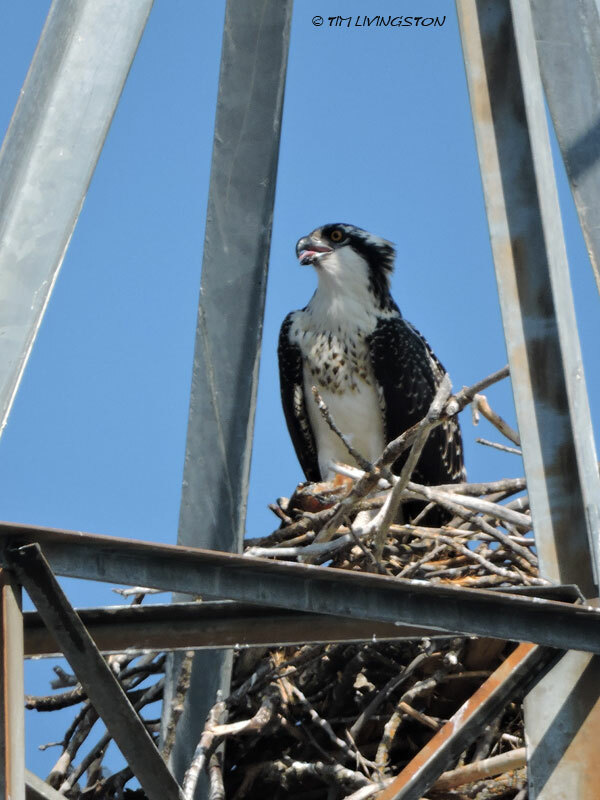 She brings in a fish for teasing her youngsters into following her. Her behavior has inspired my confidence in their future success. 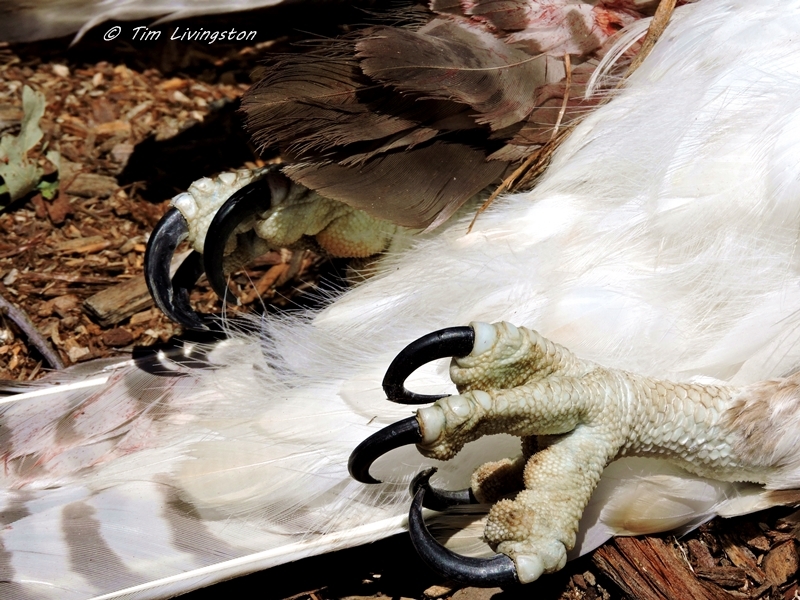 After examining the photos I took of the dead osprey, I’m pretty sure it was the male bird that was struck by the helicopter blade. 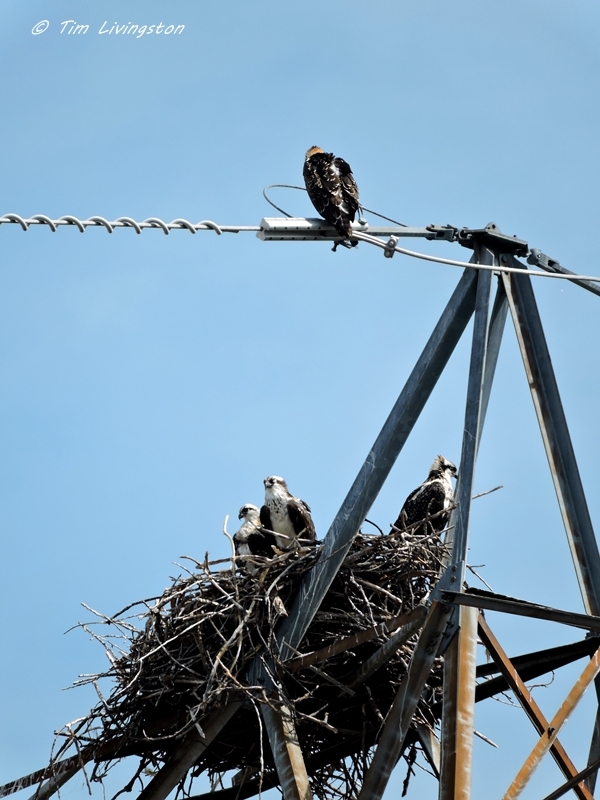 Now, mother osprey soldiers on. No news yet on the Fish and Wildlife warden’s investigation. 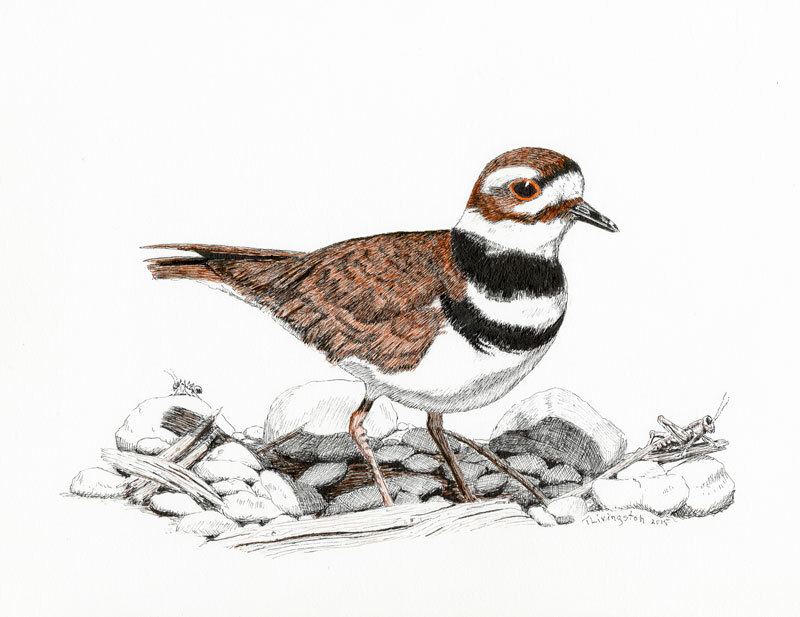 Killdeer in colored pen and ink, and in person.